Taste: Very strong and refreshing flavour of green tea with a hint of lemongrass. 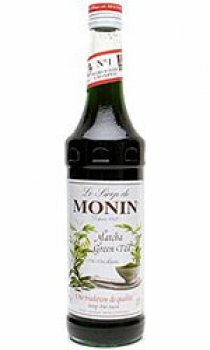 With Monin Matcha Green Tea syrup, create unique and flavoured signature drinks. It will bring a real Matcha taste, sweetness, freshness and an amazing colour to all kind of beverages, from lattes to alcoholic cocktails. Matcha is a special type of green tea: a precious, jewel green. It is the highest quality tea available in Japan. The tea leaves are hand-picked from various varieties of tea plants, blended to produce the best flavour and stone ground into a fine powder. Matcha has been used for over eight hundred years in Zen Buddhist ceremonies. For the traditional Japanese Tea Ceremony, it is drunk from a single bowl as a sacrament. Green tea is getting more and more popular with the growing awareness of its health benefits, and Matcha is even healthier as leaves are consumed entirely. The high concentration of antioxidants, vitamins, minerals and fibres makes the Matcha one of the healthiest natural beverages. Best Served: Lattes, Iced drinks, Martinis, Smoothies, Cocktails, Mocktails.